While it may be true that nature has been kind to the Champagne region, it is also true that man, with his know-how, boldness, and above all persistence, has managed to get the very best out of this unique terroir. It took him three hundred years, in which he faced the toughest of tests, to give the planet this symbol of celebration and shared enjoyment. The history of the House of Mumm covers a century and a half of passion, dynamism and the pursuit of excellence. 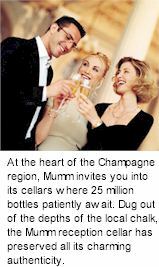 It is this tradition that has given rise to the renown and worldwide appreciation of Mumm and the famous Cordon Rouge. The Mumm brothers, Jacobus, Gottlieb and Philipp, who were from a rich family of German wine merchants and who also owned vineyards in the Rhine valley, arrived in Reims in 1827. Along with their business partner Friedrich Giesler, they set up P.A. Mumm et Cie, the initials standing for the forenames of their father, Peter Arnold Mumm. Most of it is located in the seven most renowned Grands Crus of the champagne growing region, Ay, Bouzy, Ambonnay, Verzy, Verzenay, Avize and Cramant, which are classified on average at 98% in the quality scale. A loyal partnership with local winegrowers has extended this production area. These vineyards ensure that Mumm's cellarmaster has a broad range of supplies and a palette of the highest quality. Richness and subtleties of the Mumm vineyards traditions and know-how built up over generations, a constant awareness of quality - the spirit of the Maison Mumm, expressed with refinement and generosity in the range of Mumm champagnes. The right to the champagne appellation has to be earned; and just to be considered for this privilege means meeting very rigorous criteria. These cover every step, from the treatment of the vines to the birth of the bubbles in the bottles. At each stage there is stringent legislation to be followed. Pruning takes place in winter through to the end of March. The purpose of pruning is to ensure better ripeness of the grapes and to improve the quality of the wine. Then, between 15 March and 1st May, the vine shoots are trained along rows of wire. So as to ensure perfect protection of the grapes, harvesting machines are not authorised in Champagne. The grapes are picked exclusively by hand, parcel by parcel. 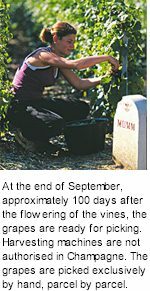 For three weeks in September Mumm needs almost 1,000 harvesters. 4 000 kg of grapes give 2,550 litres of juice. One vine plant makes an average of one bottle of champagne. While the terroir determines the quality of the wine, the process of blending the different crus decides the personality of each champagne house's production. In January the cellar-master creates the blend using a selection of over 100 different crus: this rich, complex blend gives the champagne its intensity and character. Mumm invests constantly in research to ensure continual improvement in the quality of its champagnes and to provide its vineyards with the most modern techniques while preserving the authentic character of the resulting wines.